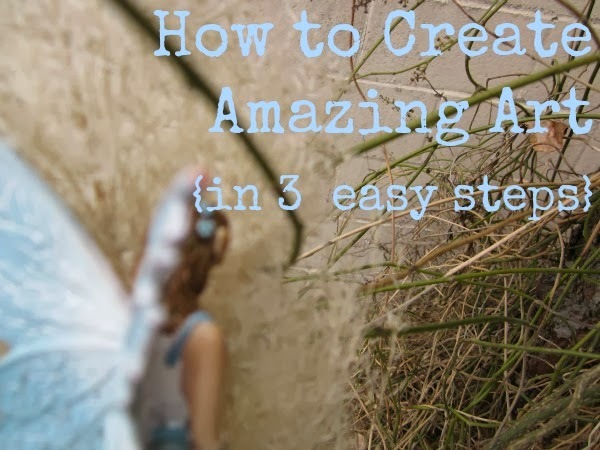 We all want to create something amazing but knowing where to begin can be rather daunting. The following are a few steps to help you get there. 1. Set aside all preconceptions of what art is. 2. Pick up a paint brush (or tool of choice). Too easy? Not enough how-to steps? (I'll give you some later) We make creating art complicated, don't we? We think everyone else knows how to do it right or that only a few people have all the talent, so why bother? I think what people often mean when they say they aren't doing it right is that it doesn't look the way they wanted or pictured in their mind. Let me tell you a secret, tons of authors who write best-selling books often share that the book didn't turn out how they'd planned. Somewhere along the way it took a turn and they either followed it or lost their muse. Having your art look exactly like you pictured isn't always the way it should be. If you really don't think you'll be a good artist until someone shows you how to do it, then call your local art teacher. But I wouldn't recommend it...yet. This is my advice to anyone who wants to learn painting or any type of art, (these are the steps I promised you): get started and play. Somewhere between kindergarten and adulthood we lose the ability to play creatively. Find it again. Dab a brush in paint and go for it. Make swirls, make circles, draw lines. Use your hands, feet and elbows. Get covered in paint. Glue stuff on. Draw. Enjoy the process and let your art grow out of that. You know what's going to make your art amazing? You. Your thoughts, your experience and your emotion. All of your you-ness is going to seep into your work and make it shine. No one else has what you're holding in your heart. I'm not saying there isn't value in having structure and learning skills from a teacher, but I think we dismiss how much we can learn on our own just by practicing and playing. By experimenting, we learn what doesn't work, what we love to do, and where we feel most alive. Our artistic voice begins to emerge and we can add skills later to assist our art. Why not let your inner artist come out to play for a bit? I'd love to hear your thoughts on this, what other steps would you add? Or maybe your own version of three steps? It doesn't have to be only about painting, you can share steps for your version of art; whether it be a guitar, an accounting book, a sewing machine or writing. P.S. I'll be telling you more about my new painting project on Friday.